← 2013 – What Now? Some Resolutions Maybe? Names are important, maybe more so than you think at first. They’re also tricky little minxes – they either come to you, or… they don’t. Names are important in fiction because the wrong name does your character an injustice. The name, like the title of the book itself, has to be right, and when you finally get it, you’ll know. That sounds a little wishy-washy, but I think it’s true. I like to get the title of a book sorted as soon as possible, because I think it sets the tone of the work and makes my stupid brain realize that, hey, I’m actually working on a book here. If I don’t find the title, it’s always at the back of my mind, niggling away. There’s a dissatisfaction that follows me through the work. It’s super annoying. And so with character names. It should be easy – if you’re writing a contemporary, Earth-bound piece, then John Smith should do just fine for the main character. But… sometimes that doesn’t fit and John Smith is not your man, and you don’t quite know why. It comes from own experiences – perhaps, by chance, we’ve never met a John Smith that we’ve got along with. A rose by any other name, and all that jazz, is fine for real life, but in fiction? I don’t think so. For me, name selection comes from three sources: serendipity, the character themselves, and theft. I got lucky with Rad Bradley, the main character of Empire State and The Age Atomic. I was searching Amazon for Ray Bradbury while I was doing something else; distracted, I mistyped his name, and was puzzled when I had no results. Checking what I’d typed, I saw the name “Rad Bradbury”, and I immediately thought that was a great name for a non-nonsense PI, circa 1930, all trench coats and fedoras and rainy nights in the big city. As it happened, I wanted to write something along the lines of Raymond-Chandler-with-robots – and now I had my main character. The first drafts of (and early publicity for) Empire State said the main character was, indeed, Rad Bradbury, but it became clear that this was a distraction. In the end, Bradbury became Bradley, because I wanted to keep the rhythm of “Rad Brad”, and the name Bradley was a nice nod to one of my favourite DC Comics characters, Slam Bradley, himself a tough PI from the late 1930s. The easiest thing for a writer is when the character materializes in your mind, name in situ. This doesn’t happen often for me, but when it does, you’ve got the perfect name from the get-go. The main character in Hang Wire, my urban fantasy novel coming from Angry Robot in November 2013, is called Ted Hall because… he’s Ted Hall. It fits, because that’s who he is. I had no say in the matter. Similarly, the first name of the main character in my dark space opera from Tor in 2014, is Ida. Ida isn’t really even a name, or at least not a common one, but, well, what could I do? As I discovered, it was short for Idaho (and even more unlikely name); his first name is Abraham, but he hates it, so he goes by an abbreviated version of his middle name. I found this out as I was writing the first draft (and there is a reason he has the bizarre middle name of Idaho). It was out of my hands. Speaking of which, this book is currently called Shadow’s Call, but everyone agrees – including my editor, my agent, and myself – that this is pretty bland. A new title is needed… but we’re going to have to discover what it is as we work through the edit. Name theft comes in a couple of forms, I think. Tuckerisation is the most fun, when you name things after people you know, friends and family, etc. My books are full of tuckerisations – some obvious, some not so, but it doesn’t matter. Most people I’ve used have been pleased to make an appearance on the written page, and others may never know that I swiped their names! I tend to keep tuckerisation to minor characters and cameos, with one or two exceptions. Tuckerisation doesn’t always have to be about using the names of people you know, either. 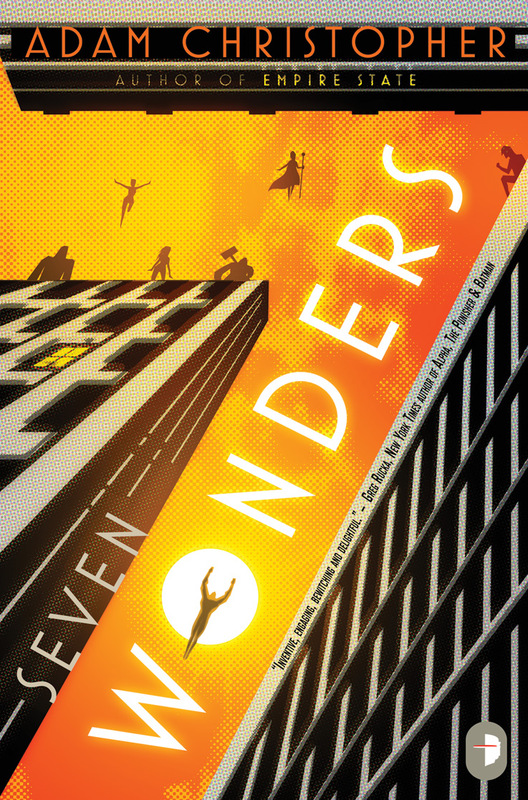 Geoff Conroy in Seven Wonders is named after DC Comics superstar Geoff Johns and Kevin Conroy, the voice of the animated Batman. The main character in that book, Tony Prosdocimi, is named after Tony’s Theme, a song by the Pixies (which begins with the spoken line from Kim Deal: “This is a song about a superhero named Tony”), with the surname of a friend of mine in Italy. The other sort of theft comes from desperation, when you really need a character name and you really need it now, and this paragraph isn’t going anywhere before you delete Jackson Sweeny and replace him with someone a little less like a baseball player from the mid-Fifties. I do most first draft writing in my library, and the spines of books are terrific places to steal names from. While I’m unlikely to name a character Stephen King or George R. R. Martin, George King might do well enough… although Steve Martin, maybe less so. Of course, character names are just part of it – you also have to name cities, spaceships, alien races, the works. But the same rules apply – strike it lucky, borrow something, or, just maybe, those places and things will do the work for you. Adam Christopher on Twitter, Facebook, and Web. The next guest author is Amanda Carlson on the 17th. You can find the full schedule here. Until then! Posted on January 14, 2013, in Debut Authors Guest Series, Guest Posts and tagged 2012 Debuts, Adam Christopher, Angry Robot, Debut Authors Guest Series, Empire State, Guest Posts, Names, Names A New Perspective, Science Fiction, Seven Wonders, Superheroes, The meaning of Names. Bookmark the permalink. 1 Comment.